Buzzy spot at downtown oasis Klyde Warren Park offers picturesque 360-degree views and American comfort food with a few twists. : Savor’s neutral, minimal décor wisely takes a backseat to the view, a picturesque panorama of the surrounding park and the high-rises beyond. 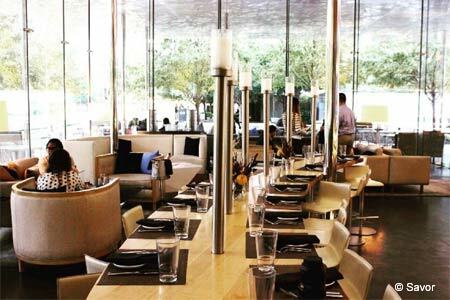 And while the striking surroundings at Klyde Warren Park's crown jewel may take center stage, that doesn't mean patrons can't find plenty of good things to eat and drink. Settle into a plush booth in the dining room where quiet conversation is entirely possible, or head to the bustling, crowded lounge where a chic crowd happily sips on well-executed craft cocktails or wine poured from the one-of-a-kind tap wall --- a unique feature that means reds, whites and rosés are always at the perfect temperature. When it comes to food, appetizers are the most gratifying category. Crab cakes are diminutive in size but come set atop a lively curry sauce; meatballs are light, tender little orbs (though perhaps overshadowed a bit by an intense olive puttanesca sauce); and crispy lobster puffs oozing with molten Gruyère would be welcome at any table. A scallop entrée with Brussels leaves and sweet kabocha purée could benefit from a sauce to bring it all together, and braised short ribs over mac ‘n’ cheese are a bit dull but hearty enough to satisfy. Even those who fail to save room for dessert can probably manage one (or three) of the fun $3 minis; don't miss the salty caramel pudding.